Radiation portal monitors are now installed at every port of entry along U.S. northern and southern borders. All vehicles and cargo entering the U.S. via the RPMs are scanned for radioactive materials. RICHLAND, Wash. — A significant national security milestone was met recently with deployment of radiation detection technology that spans from coast to coast. Today, all vehicle cargo crossing the U.S.-Canadian border is scanned for radioactive materials. 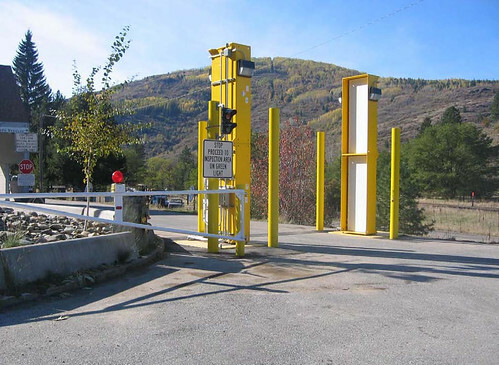 The Department of Energy's Pacific Northwest National Laboratory recently completed installation of the radiation portal monitor system securing all land ports of entry via the northern border. "This marks a key accomplishment for PNNL by meeting a target set by the U.S. government dedicated to protecting and strengthening our borders," said Asim Khawaja, project manager of the Radiation Portal Monitor Project. This fall, PNNL completed installation of radiation portal monitors along the northern border. The 104th port of entry in Trout River, N.Y., was completed two months ahead of schedule. Today, radiation portal monitors, or RPMs, extend a line of security from Maine to Washington, as well as the Alaska-Canadian border. With these recent additions, more than 850 RPMs line U.S. northern and southern borders. For the past 18 months PNNL worked closely with the Department of Homeland Security's Domestic Nuclear Detection Office and U.S. Customs and Border Protection to deploy this high-tech line of defense. Each RPM is capable of detecting radiation emanating from nuclear devices, dirty bombs, special nuclear materials, natural sources and isotopes commonly used in medicine and industry. Once alerted, CBP personnel stationed at each border location determine if the radiation is a potential terrorist threat, a natural source or a legitimate medical or industrial source of radiation. Similar to a radio receiver, RPMs respond to certain types of energy, which when triggered alert a trained operator. The RPM technology provides the CBP a non-intrusive method to conduct the scanning while causing minimal impact to legitimate travel and trade. Before deployment, the operational readiness of each portal monitoring configuration is thoroughly tested and verified by PNNL technical staff at the Integration Laboratory in Richland, Wash. Scientific experts in fields such as nuclear physics, radiological engineering and statistics conduct the developmental and operational testing and evaluation. By late 2010, the laboratory will complete construction of new Integration Laboratory facilities to provide enhanced testing of performance and detection capabilities. In 2002, PNNL began installing RPMs at more than 200 ports of entry along the nation's southern U.S.-Mexican border. The lab also began a program to train CBP officers needed to operate the RPMs. The number of trained officials now numbers into the thousands. PNNL's current project schedule extends through 2014, providing system maintenance, training, and enhanced equipment and performance development and testing. Staff from every division within PNNL contributed to this project, providing interdisciplinary expertise to support this national security priority.